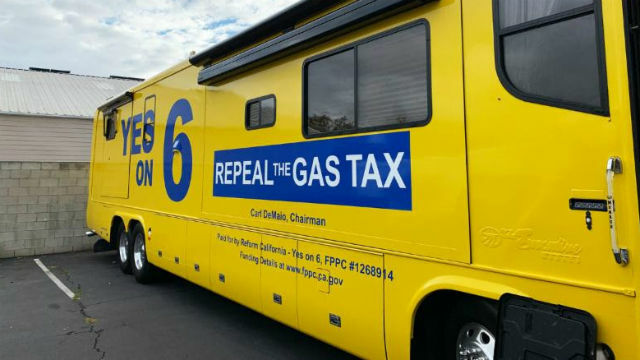 Opponents of the gas tax increase plan two weeks of “rush hour rallies” beginning Wednesday to encourage support for Proposition 6 in the November election. Carl DeMaio, chairman of the Yes on 6 campaign, will lead a bus tour starting in San Diego and traveling to 21 other cities, ending in Chula Vista on Oct. 25. The rallies will typically take place during the morning or evening rush hours. “We’re traveling throughout the state to make sure that despite the false and misleading label put on the ballot by politicians, Yes On 6 is the gas tax repeal — and by voting “yes” on 6, they’re reducing their cost of living and holding the Sacramento politicians accountable,” said DeMaio. The ballot measure would repeal Senate Bill 1, which raised the gas tax by 12.5 cents per gallon of gasoline and 20 cents per gallon of diesel to fund road, bridge and transit improvements across the state. The gas tax increase is forecast to generate $54 billion over a decade, and many projects funded by it have already been started. But supporters of a repeal say the increase will cost an average family of four $779 annually and argue that the same improvements could be funded by making Caltrans more efficient.